Mi Pasion is a worship/gospel album released in 2004, the third album by Christian recording artist Ericson Alexander Molano. The album was produced and distributed by Molano's own production company, Jehova-Nisi Productions. It was recorded in Santa Ana, California, in front of a sold-out audience. The fourteen-track album includes the hits songs "Mi Pasion", "Melodia Angelical", "Siento Su Gloria" and "Rendir Mi Vida". After the recording of Mi Pasion, Molano went on to sing a special love song to his girlfriend, Nancy Garcia. Following the song, Molano knelt and proposed to Nancy who said, "Yes." In this album, Molano used his original band. 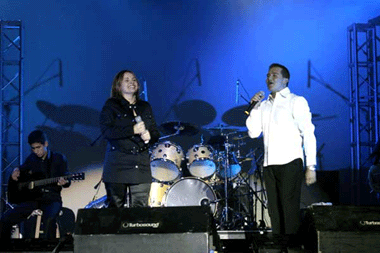 In 2002, Molano participated in a live recording with other Christian singers for which he wrote "Rendir Mi Vida A Ti". For Mi Pasion, Molano had a different sound and renamed the song "Rendir Mi Vida". 12 "A Dios Sea La Gloria"
^ Every song is written by Molano except "Libre Soy", "Te Alabamos", "A Dios Sea La Gloria" and "Santo"
Additional studios: Cherokee Studios, Hollywood / Nda. House Studios, Tarzana, California / Ariza Records, Paramount, California / Nido Entertainment, Van Nuys, California / MonteCristo, Mexico D.F. ^ a b c "-JUDAH PRODUCCIONES – MI PASION". Judah Producciones. Archived from the original on July 13, 2007. Retrieved July 24, 2007. ^ Lo Mejor de Ericson A. Molano (DVD). Jehova-Nisi Producciones. 2007. ^ "Ericson Alexander Molano – CD. MI PASION (En Vivo)". Pan De Vida. Retrieved July 24, 2007.